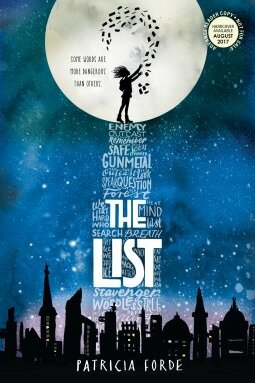 Patricia Forde's The List is a Middle-Grade Dystopian novel and it is based on many other novels in the genre. Many will recognize classics and may appreciate this. After global warming hits the world and the Biblical flood happens again, a man creates a modern ark. In this eco-friendly ark, the last survivors on earth try to recreate a world where people are controlled. Noa has seen how humans have betrayed themselves by the foul use of words. By consequence, the Ark can use only 500 chosen words. This world is minimalist since it rations everything. It proves the power of the words to humanize or dehumanize. Being limited in words rips us of choices and makes us feel trapped. Some emotions, some feelings cannot be expressed with just a few words to choose from. Art cannot exist. Communication is reduced. When Letta, the main protagonist, uncovers a plan to suppress language altogether, which will rob Ark’s citizens of their power of speech, she decides to act against it. Although the concept is fascinating, the novel in itself is on the slow side and many characters are two-dimensional. The idea of everybody in the Ark being indoctrinated and following like sheep did remove some of the pleasure of reading because it was hard to care for them. The people outside the Ark on the other hand are more developed and seem more enlightened. That makes this world seem more black and white: the good guys on one side and the bad guy on the other side. Honestly, I am surprised that so much violence and such a grown up concept would slip into a Middle Grade novel. I almost want to say that this novel would have done better with an older audience in mind. The part where they rebuild the world was interesting and the novel overall is unique because it gives the reader a reflection on how important culture plays in our happiness. Communication, invention, art, choices in food and in mates, freedom of deciding on our fate, etc., are important to thrive. Mere surviving and being enslaved by a code of conduct are not living. In brief, a novel that has a lot to please, but that lets me with mixed feelings. 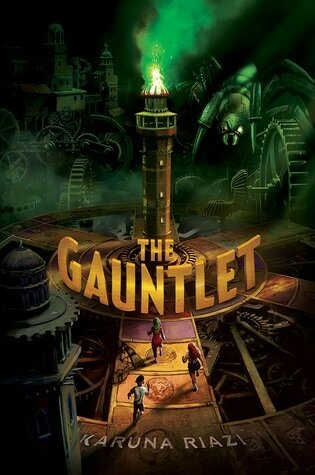 The Gauntlet by Karuna Riazi is released in March 28, 2017. It is a fantasy Middle Grade Novel that mixes some elements of Jumanji with some elements of The Forbidden Game. Add to this a Middle Eastern flair. When a board game magically appears at her doorstep, Farah thinks it’s a present for her twelfth birthday. When it grows ten times its size on top of a sand dune, and one of the pieces looks like her, she decides it’s just a game. But when Farah's brother disappears into the mechanical board, she and her two best friends dive in to save him. They will have to dismantle the game to survive and save generations of kids trapped in the maze. If they do not succeed winning the challenges, they will be trapped forever or until someone else rescue them. This story will keep you at the edge of your seats with rich descriptions, multi-cultural encounters, vibrant places, and mouth-watering foods. Adventurous and fast-paced, this novel features Farah and her friends battling camel spiders, scorpions, grease monkeys, and sand cats. They will even have to beat Amari, the diabolic builder of the board, at his own game. The novel will touch you by the unconditional love Farah has for her brother, and the sense of community and camaraderie. Great twists, clever solutions, atmospheric writing, and whimsical magic will enchant you and transport you to another world. Amina's Voice: Finally An Authentic Voice! 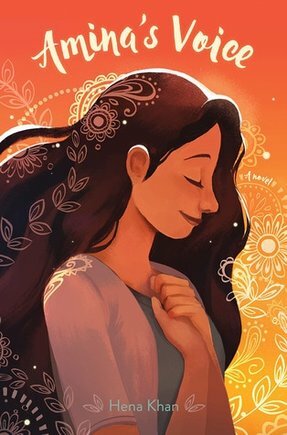 Amina’s Voice by Hena Khan is released in March 14, 2017. It is a compassionate tale of a Muslim girl trying to find her voice as a person as she learns about good and bad. Her struggles transcend culture, race, and religion. Kids will want to stay with her so much longer. She will probably linger in your mind because she grows on you as you read more. 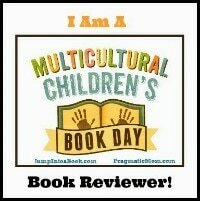 This is a sweet story of a girl who you will easily identify with despite embracing different beliefs and belonging to another culture. The family’s dynamics are well done and will make you laugh and want to cry. The author has a unique way of looking at the world and will enchant you by her comparisons. I recommend starting with chapter 2 because that’s where Khan’s magical talent really starts to shine. I really love Amina’s best friend, Soojin, a Korean immigrant. Amina identifies with her in unique ways. They both leave their shoes at the entrance of their house. They both like to sing. They both connect despite their obvious differences. And the parents a hilarious. The only thing that bothered me is how painfully traditional this Pakistanis family is. I am sure Pakistanis kids will recognize themselves here. The themes too are recurrent ones. A girl trying to fit in a different culture, parents who are liberal, but welcome a very traditional Muslim in their homes, Bollywood, the betrayal of a friend, the father being a Pakistanis doctor. However, because the novel was written by a Muslim, it has a unique angle to it. Amina’s uncle reconnects her to the music of the Quran, her holy book, despite being a strict Muslim. He even recognizes that the US is good for them before he returns to Pakistan. That was unexpected. The way the mom handles the diverse interpretations of the Qur’an is moving too. We have the feeling that this community can live with all their differences. Many novels dealing with Islam and written by non-Muslims show teens rebelling against what they’re told and being a total wreck. It’s like they do not understand that Muslims can be loving and respectful. Amina, the main character, is unique in this way. She doesn’t go around throwing away her hijab and badmouthing her uncle. She listens and learns like most teens. I could truly connect with her as a person and someone well-integrated in her community and well-adjusted to the world. The story is a huge step away from the traditional literature that shows Muslims as resilient to change, intolerant of other cultures, and judgmental. Amina is none of that. She is the regular Muslim you will meet at school, in the street, or in the mosque. The way Amina cries when her brother is accused of smoking. The way she reacts when her uncle announces that making music is not Islamic and talking about other behind their backs is haram (forbidden). She doesn’t react violently, but listens and questions. She is ready to learn and she is tolerant. That made her so much more believable or so much relatable and authentic. PS: Hena Khan is not knew to the world of literature. She has published other successful books before Amina's Voice. Check her books out. 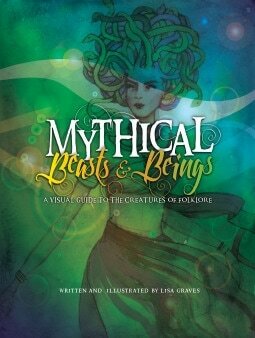 Mythical Beasts and Beings by Lisa Graves is expected to be published March 24, 2017. This is one of the books that will inspire not only children, but also fantasy writers. First, the author painted beautiful depictions of the creatures. Second, the information is simple and complete. While we believe we know a lot about gnomes or the Kraken, we might still be wondering about their origin and their less-known powers. Lisa Graves throws in a number of facts that will astonish you and will incite any curious mind to read further. I was expecting a long list of mythical creatures, a little like an encyclopedia, but the author chose to classify them under types. Under each type, readers can find the name of similar creatures. I was surprised to learn that pixies are another version of jinn. I learned about quite a few other creatures, such as the Leshy, covered in vines and sometimes shape-shifting into a plant form. The book inspired me. It made me want to integrate some of the less explored creatures into my stories. Some of the overdone creatures in novels have more powers than I thought. For example, sirens can predict the future and possess telepathic powers. How well could this work in a paranormal novel under the sea? Did you know that in the Pacific islands, people believe that humans descend from mermaids and mermen? A lot of research awaits you. You favorite creature might surprise you. A beautiful story could emerge from it. Kids might be in awe. This book might prove invaluable to any fantasy writer as well as children wondering about the creatures they find in books and movies. I have only one wish: that this book contained further resources to look into. Lisa mentioned some movies here and there, but she omitted a bibliography, which might remove some of the credibility to the research. Overall, I consider this book a great tool for teachers and parents. If you are a storyteller, it will help you refresh some ideas you have of mythical beasts and beings. There is room for more discovery and notetaking. A quick and easy read, laden with fun facts, this book will delight adults and kids alike. Dedicated to Brandon Sanderson, Jed and the Junkyard War by Steven Bohls is a must read. 12-year-old Jed is searching for his missing parents, but on the way discovers he’s been spirited from a junkyard. His parents left him with an odd key and an odd set of instructions: “go to the junkyard” behind the dishwasher, and “push every red button you find.” This by itself is enough to get anyone’s attention. 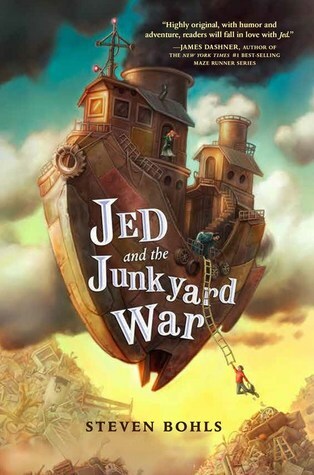 Floating over an ocean of heaping junk, in a unique, steampunk world where the currency is batteries, Jed will have to fight dreads, creatures assembled from random bric-a-brac. Oh, but it’s not finished. There’s a treasure map that doesn’t exactly lead where it's supposed to. My nine-year-old son was immediately hooked by the action-packed, easy language, clear stakes, and the fresh world. This book was fun to read and introduced us to a world every little boy probably dreams of. Plus, it has a great cliffhanger at the end of the book that kept us wanting for more. What makes this book really successful in my opinion is that the novel’s conception is very Disney-ish and follow a well-known and irresistible structure. Boys will feel at home.